Halloween is here and whether you have kids or not, bite-sized Halloween candy is everywhere. From people bringing it to work, to seeing it at the grocery stores on sale, it’s unavoidable and easy to be tempted! So, I dug deep into my womanly self to not think about how much I love chocolate and came up with strategies to help you with candy cravings. Trust me, I’ll be using these strategies too. Part of the lure of Halloween sweets is the deceiving nature of bite-sized candies: Eating small pieces doesn’t feel as fattening right? But then you realize that you have eaten more than one. However, you can still enjoy that mouth-popping satisfaction; by swapping the junk for a healthier snack like almonds. You can even create your own trail mix and add some raisins for sweetness. Remember, nuts can be high in fat, so be sure to eat them in moderation. Prepare for the dreaded candy bowl by keeping healthy snacks at your desk or nearby. Need a quick sweet fix? 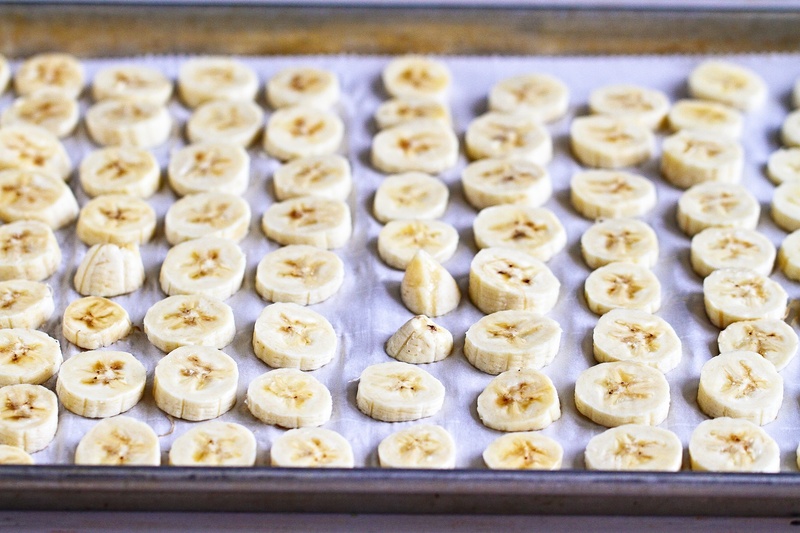 Slice a banana into pieces and place on a tray in the freezer for 20 minutes. Throw pieces in a plastic bag, and store in your work freezer. Eat as a sweet cool treat to satisfy your tempted sweet tooth. *If you’re already armed with healthy alternatives at work but still find yourself giving in, leave the empty wrappers on your desk. I said that right? Don’t be trying to hide your wrappers in the garbage can. It will be a reminder that you had your treat for the day, how many calories you consumed, and hopefully ward off future temptation. If you're not buying any sweets until 31st, you are already ahead of the game. If you did buy candy, and still have some left over from the trick-o-treaters, next time limit the amount of candy you buy if you do get trick-o-treaters. Also, buying candy on the last day can work to your advantage because it is less time you have to look at the candy in your own home! 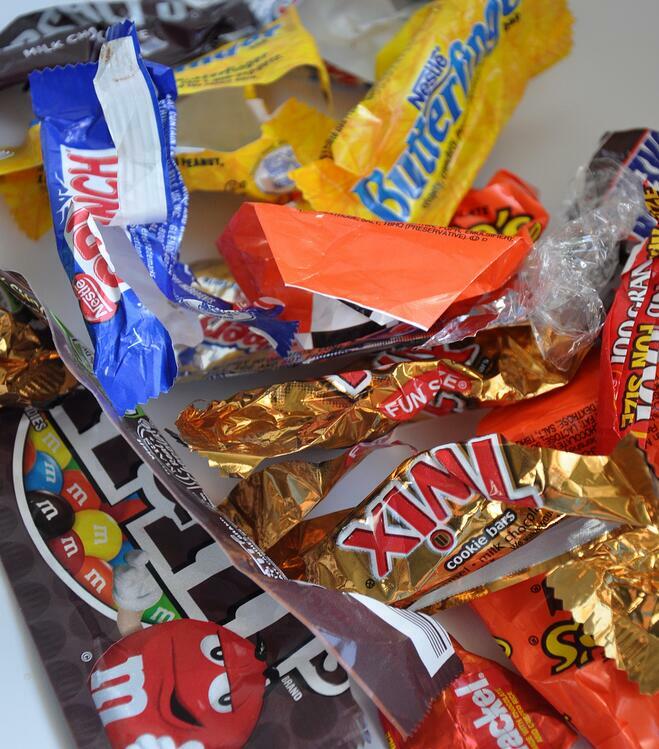 If you do have kids, and they have a ton of candy, most parents just throw it away. Parents: Don’t eat your kids candy. You will end up with cavities and calories. If you do cave, opt for dark chocolate because it has twice the amount of antioxidants as the milk-based kind. Look for a high percentage of cocoa, because that means there is less added sugar, plus cocoa contains flavonol, which some research has shown can lower blood pressure. As with all candy, MODERATION is key. So, maybe you had a piece of candy… maybe you had two…or three. I get it. I love chocolate too. What women doesn’t? Especially TWIX, Reeses PB Cups & KitKats! Okay, you get the point. You ate it. It’s been done. The best thing you can do about it now is to workout! I promise it will make you feel better and I have a workout you can do right here and get your candy burn workout on! Hope you enjoy the strategies! 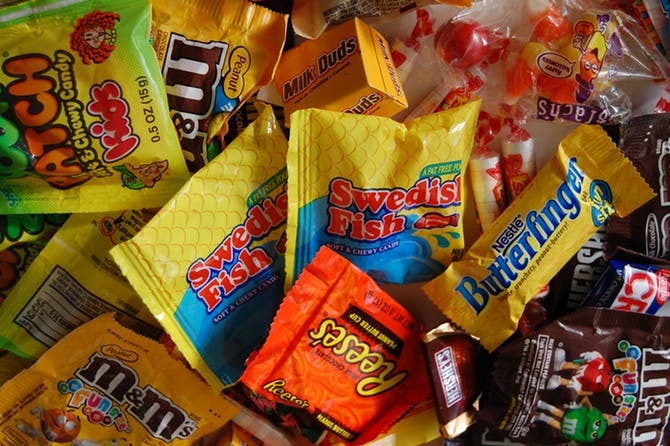 Also if you have any of your own helpful tips that help you curb your Halloween candy cravings, we would love to hear about it in the comment section below. Just drop us a line and we’ll be sure to respond.